Positioned at an affordable price pointe, the ScubaPro MK2 EVO R195 simple unbalanced design delivers bullet-proof reliability and great performance at recreational depths. A great choice for an entry-level regulator or perfect set for deco stages. 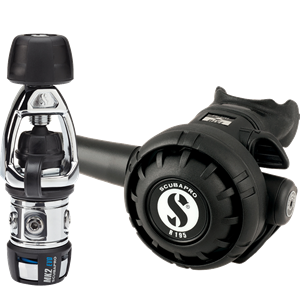 If you’re someone just starting out with scuba diving the Scubapro MK2 Plus R195 would make a great entry-level scuba regulator. Its reputation for durability, reliability, and ease of maintenance makes it a great match for new scuba divers doing recreational diving. It is no wonder why you will find it as the preferred training scuba regulator at many dive centers and resorts around the world. In this review, we are going to take a closer look at what makes this regulator stand out from others on the market, as well as our thoughts and rating. Who Is MK2 Evo R195 Designed For? In the video, you can get a closer look at reg as well some of the key features which make it stand out from other regulators in its price range. The MK2 is Scubapro’s entry-level first stage regulator and has been around for decades. It is time tested to be reliable and tough. It features an unbalanced piston design which should mean increased breathing resistance at depth and low tank pressures. However, advancements over the years have made this hardly noticeable by divers at recreational diving depths. It is also equipped with Scubapro’s Venturi Initiated Vacuum Assist (VIVA) System. In “Min” mode it helps prevent free flows on the surface, and in “Max” mode it delivers the best performance while diving. The new upgrade in Scubapro’s XTIS system, which insolated the mechanical element from the cold, has given the first stage an increase freezing resistance by 50% over its predecessor. Simple Unbalanced design increase reliability but sacrifices performance. Competitively priced for the entry-level market. It deliver excellent value for the money. Overall the feedback from divers who’ve used this regulator is quite positive. Many of them found the regulator the regulator to be very reliable and deliver great performance for its price point. Although this regulator is unbalanced many divers report that they did not notice any difference in breathing even at the edge of recreational diving depths. And the Veturi switch does help manage free flows on the surface. There were no significant reviews of the regulator being used in cold water, so there was not much to report there. The Ideal use for this regulator would be in warm water at a depth no deeper and 130 feet. The MK2 EVO R195 regulator is clearly designed for new divers just starting out, as well as seasoned divers looking for an affordable regulator that is dependable. Its compact size and design also make it great for a pony bottle and for a designated travel regulator. Can you dive Nitrox with this Reg? Yes, the Mk2 Evo R195 is rate up to 40% Nitrox. Is it available in DIN? Does this come with an alternate air source? Like most new regulator you will purchase, it does not come with an alternate air source. You will have to purchase one separate. The Bottom line is, The MK2 Evo R195 is the perfect regulator regulator if your a new diver, and the go-anywhere reg for veteran divers who like to keep their diving simple and fun. It also competitively priced at a point that will not break the bank. Do you have any experience with the MK2 Evo R195, good or bad, please feel free to share in the comments below.